Hayashi Rice is Japanese western food. Just like curry, it served with rice. It is a tomato paste stew. 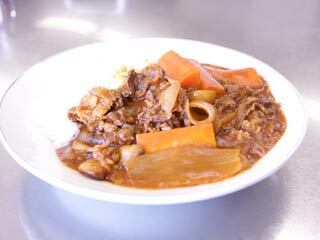 Hayashi Rice is also very popular Japanese food. First, cut onion. Peel it and cut it to 6 pieces. Next, cut carrot 5cm wide, and peel them and cut them about one bite size. Next, Mushroom. cut them about 1cm wide. Cut beef into one bite size. Add 550cc of Water and boil it. Then remove them into the other pan. Then boil it for 15 min. with a middle heat. After 10 min of boiling, grill beef half way. Stop the heat and add Hayashi Rice powders. Boil it for another 10 min. Prepare rice on a dish and pour Hayashi Rice over the rice.